Tattoo designers: Who do they ink they are? 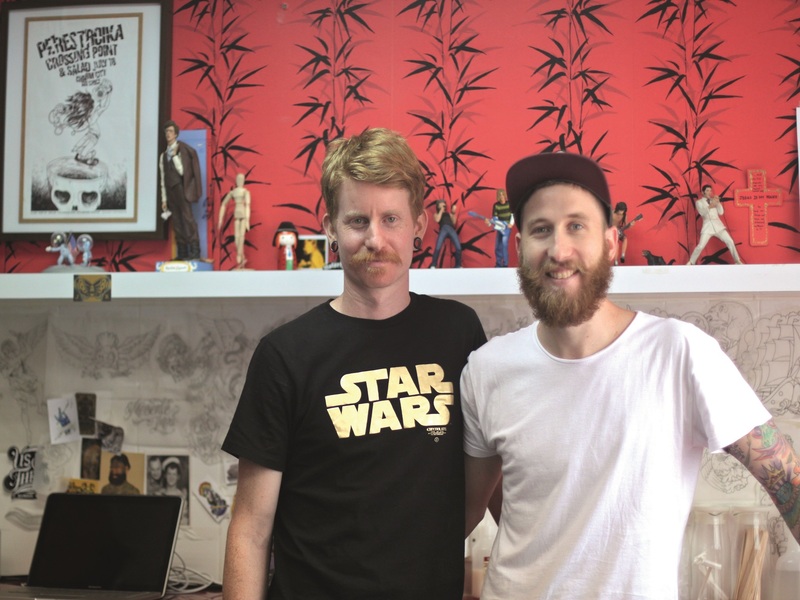 Donna Brewer profiles some of the coolest tattooists in Hong Kong. Photography by Janice Li. Clientele: Expat guys, local and travelling girls. Price: $1,000 an hour (for over two hours); Smaller pieces start from $500. What's it like? Walking in is like walking into your friend’s flat, cue comfy sofas and soothing music. Then you see Rich and Ross – South Africans who came to HK a year ago to pursue their dream of running their own studio.Why did you become tattoo artists?Ross: We were both in advertising and hated our lives. We could see a need in South Africa for tattoo artists who cared about the craft.What do you love most about your job?Ross: The people we meet – we get to see the world through our clients’ eyes and it makes every day different.Any advice for someone who wants to get a tattoo? Rich: Choose something timeless and don’t worry about it not looking good when you’re 80 because you won’t look good when you’re 80 anyway! What's it like? With a waiting list of two years at Tattoo Temple, it’s clear how in-demand Joey Pang is. Filling the niche of calligraphy tattoo and specialising in Chinese and Japanese styles, Pang’s studio attracts dedicated body art lovers from all over the world. Why do people get tattoos?For our clients it’s all about art appreciation. They will dedicate as much time as it takes to turn their body into a piece of art. It’s not to shock anyone, it’s not to look cool – it’s to enjoy their body as a canvas for art.Advice for someone who gets cold feet?Go away until you are 100 percent sure. Unless you are certain about what you want, we won’t touch you. We won’t even let you through the front door. What makes a good tattoo artist?They will create art on the body as you view the body as an entity – therefore all the tattoos must be able to merge to complement each other. What's it like? Jimmy Ho learnt everything about the trade from his father, James, who was the first tattoo artist in Hong Kong. Jimmy’s 40-year long career has seen him ink countless filmstars and gangsters. Surprisingly, the body of the veteran is without a spot of ink.Has there been a big change in the industry in HK?Recently people began to accept that not only bad people had tattoos. Especially when a lot of celebrities started to lead a trend of getting stylish tattoos.Why do people get tattoos? Sometimes there’s no reason and it’s more like a sudden urge. I have tattooed professionals and big names in the past who have had their spouses’ names tattooed on their bodies so they don’t stray – it’s a security thing.What is the most number of clients you have tattooed in one day?During the Korean War, my three students and I would tattoo 30 to 40 American soldiers per day. What's it like? A mounted fox’s head greets you as you enter Blackout Tattoo in Causeway Bay, and the edgy style of the studio reflects the style of Australian owner and artist Rob Kelly, who has lived in Hong Kong for 17 years.Why did you become a tattoo artist?The idea of putting art on people fascinated me. Art can be transient but on the body it’s there forever. Tattooing is as much a craft as it is an art and it was the technicality that I thought would be cool to master.Would you ever ink an unoriginal design?No. If it was an exact copy and they refused to let me work on the design then I’d refuse to tattoo them.Advice for first timers?Choose a clean studio, find an artist who consistently produces pieces that you like, eat a good meal before you go in, don’t get drunk, remain relaxed and always remember that it never hurts as much as you expect. Tattoo Artist Gabe Shum has been acknowledged as one of the most inspired tattooists in Asia. He has also inked a small tattoo on David Beckham. Specialises in temporary tattoos that last from one to three weeks. Those who can’t decide what to ink should pay a visit here before they go permanent. Conveniently located above the stretch of bars on Lockhart Road, this is the place where you can ink ‘I Love My Wife’ on your face at the end of a pub crawl. Female Chinese tattooist Sze C specialises in very artistic tattoos such as scripts, butterflies and other custom designs. Although there are many types of tattoo removal procedures available, such as Intense Pulsed Light and dermabrasion, laser removal remains the most popular choice of them all. So, what do the experts have to say about this procedure? “Overall, the treatment is safe, but the effectiveness does depend on the colour or type of the tattoo ink used, as well as the wavelength of the laser used in the treatment,” says Dr Nicola Chan (left), honorary clinical assistant professor at HKU’s Division of Dermatology. But using laser doesn’t come without risks. Dr Tinny Ho, specialist in dermatology at Skincentral, warns: “Laser treatment is not without pain. Other risks include skin discolouration and permanent scarring.” Tattooist Joey Pang believes that once a tattoo is on, it’s on. She says: “When each [laser] session costs around $3,000 and the procedure is more painful than getting a tattoo – what’s the point?” One thing is for sure: it is highly advised that you consult a professional before you commit to any treatments.